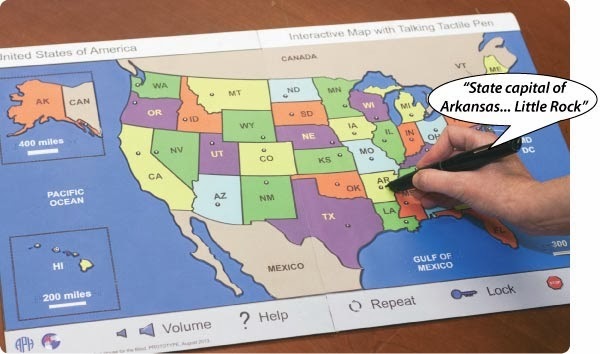 APH is seeking field evaluators for the US Map with Interactive Talking Pen, the outcome of a collaborative effort between APH and Touch Graphics, Inc. This interactive color/tactile map of the United States works in combination with cutting-edge Talking Tactile Pen technology. With a simple, light touch of the pen to the map, a student has access to multiple spoken layers of information for each state including the state capital, ten largest cities, immediate surroundings, land and water area, population estimate, statehood, nickname, state symbols (bird, tree, flower, and song), motto, famous people, points of interest, and interesting facts. The names of oceans, the Great Lakes, bordering countries, and mileage scales are also spoken. 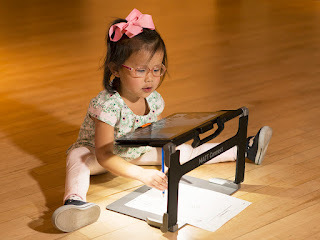 A dynamic menu bar at the base of the foldable map allows adjustments to volume, repeated information, and lockable layers of information; a convenient “Stop” button permits termination of speech and a “Help” button orients the user to the map’s layout and proper use of the pen. The audio content can be listened to through the pen’s own speaker or, for better quality sound, standard headphones or external speakers can be plugged into the audio jack near the power button. The Talking Tactile Pen comes with a USB cable for recharging of the pen’s batteries after several hours of use. Field test sites will be selected based upon geographic location, number of available students, and type of instructional setting. Preference will be given to those who have not recently field tested an APH product. The number of prototypes is limited. Field testing will begin in February 2014 and extend through the end of April 2014. If you are interested in possibly serving as a field evaluator, please provide the following information: your name, title, school/agency, type of setting (e.g., residential, itinerant), number of available students (with ages, grade levels, and primary reading media indicated), and your complete contact information (phone number, mailing address, and email address). Send this information to Karen J. Poppe, Tactile Graphics Project Leader, kpoppe@aph.org, by January 15, 2014. You may also contact Karen at 502-899-2322 or 800-223-1839, ext. 322. Thank you!